Unpredictable weather calls for versatile style and the NikeLab ACG GORE-TEX ® Men's Jacket delivers. Lightweight, waterproof 3-layer GORE-TEX ® has a breathable technology that helps you stay dry, while a detachable hood wraps around your neck for extra coverage. If the sky clears, interior straps let you carry the jacket wherever your next move is. Unpredictable weather calls for versatile style and the NikeLab ACG GORE-TEX ® Men&apos;s Jacket delivers. Lightweight, waterproof 3-layer GORE-TEX ® has a breathable technology that helps you stay dry, while a detachable hood wraps around your neck for extra coverage. If the sky clears, interior straps let you carry the jacket wherever your next move is. A 2-way front zip and drawcords at the waist and hem let you change up the fit. Snaps at the detachable hood provide adjustable style. GORE ® C-KNIT™ Backer Technology features a densely knit laminate layer that keeps you dry without adding bulk. Zipped front pockets offer secure storage. Have your say. 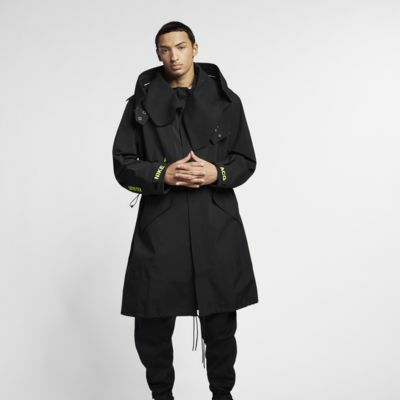 Be the first to review the NikeLab ACG GORE-TEX ®.